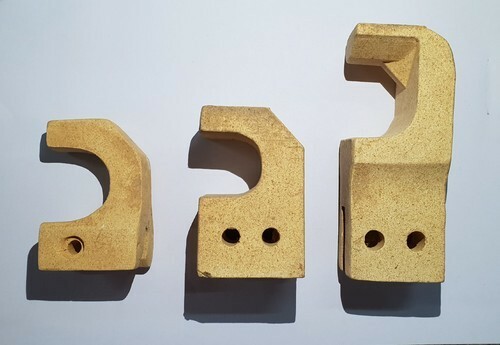 With the help of our experienced engineers, we are able to offer a qualitative conglomerate ofWooden Hooks. Our products are manufactured using finest quality material under the strict surveillance of our experienced and qualified professionals. Moreover, clients can avail these products in various shapes and designs at market-leading prices. Leveraging on the sound experience of 47 years in the industry, we take pride in introducing ourselves among the top-notch organizations involved in manufacturing, supplying, exporting and wholesaling a pristine line of Ceramic Refractories & Industrial heater Items. The range we offer encompasses Beads, Band heater channel, Hooks & Runners, Cartridge Pipe, Oven Bricks, Bobbin Insulators & Many Special Items. Also, we offer Band Heater, Tube Heater, Air Heater, Bobbin Heater, Thermostats. Our products are made using best grade raw material like feldspar powder, quartz powder and china clay procured from notable vendors of the market. The team uses highly innovative methods in order to manufacture a quality range of products. Our professionals work in perfect coordination with each other for the purpose of facilitating a smooth production process. With adherence to international quality standards, we have been able to acquire a widespread clientele that spans varied areas of the globe. We have set up a sophisticated infrastructure at our premises, which helps us cope up with the bulk requirements of our honourable clients. Manned by a diligent team of professionals, this facility is outfitted with all high tech machines and advanced technology that significantly reduces the production time. Furthermore, the quality controllers of our team make sure that the products are stringently inspected on certain parameters of quality so as to ensure their flawlessness. Moreover, to simplify the tedious process of monetary transactions, we accept payments via various easy options such as cash, cheque and DD. Owing to these reasons, we have acquired a vast client-base across the world.